There aren't enough food, service, value or atmosphere ratings for KFC, Canada yet. Be one of the first to write a review! People stay away from this place! Explain to me how a personal pan combo with breadsticks jumped from 10.99 to 21.95? That is ridiculous and you just lost my business and I will not recommend anyone to eat there. People stay away from this location!! Choices include KFC, Pizza Hut and Robin's + Esso restaurant. Trans Canada Highway location with seating. Having a Robin's franchise too allows for a better cup of coffee than most locations. Could be better for a national chain. The options are limited for a small town KFC. Staff could use some training and basic manners. Combined with other business. Not a good idea. Not sure why anybody should waste money on sandwich that you can get aeverywhere. Plus they don't know what the smile is. 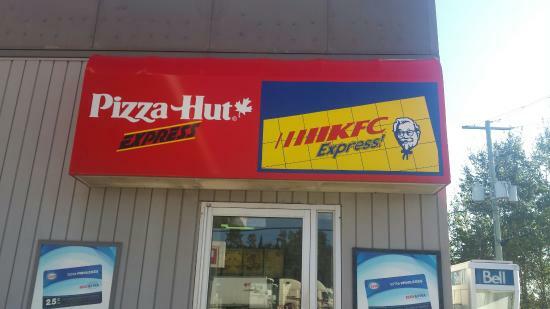 Waited over 40 minutes for pan pizza and hot wings.place is KFC And pizza hut combined. Other people walked out. Staff seemed confused as to what they were doing. They put your wraps and sandwiches together right in front of you, on the counter they just laid your change on. Flies live in the faucets, and the staff yell at each other while you're ordering. My advice is to eat somewhere else.